The 62-time capped second row is hoping to bow out on a high by helping Harlequins to the Premiership title. 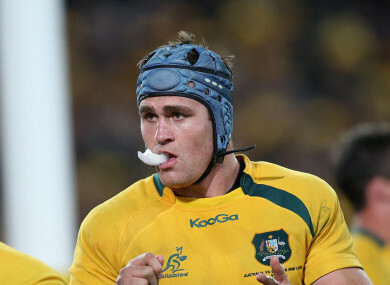 Horwill captained the Wallabies 11 times. FORMER AUSTRALIAN CAPTAIN James Horwill announced on Monday he is to retire at the end of the season. The 62-time capped lock, who turns 34 next month, could yet bow out on a high note by skippering Harlequins to the Premiership title. Horwill — who led out Australia 16 times including during the 2011 World Cup campaign — said his body had reached its limit after 13 years of top level rugby. “I have given this great game everything I have, and I feel I can no longer give what is needed to play at this elite level,” he said in a club statement. Paul Gustard, Harlequins head of rugby, hailed Horwill as a “warrior”. “James is a true warrior of our great game; the ultimate professional and someone you always want on your side,” said Gustard. “It’s been an honour and a pleasure to work alongside him at Harlequins. Horwill joined Harlequins in 2015 and was named club captain ahead of the 2017/18 season. His final home appearance will be on 3 May against Leicester although he will hope his side make it to the play-offs. Email “'A true warrior of our game': Aussie great Horwill to retire ”. Feedback on “'A true warrior of our game': Aussie great Horwill to retire ”.